When someone picks up a 12-sided die, the popular imagination generally links it with a Dungeon Master’s Guide and tales of swords and sorcery rather than spacesuits and starships, an image crystallized among the general public by Weezer, Stranger Things, Freaks and Geeks, and more. But science fiction has been a part of role-playing games since the 1970s with James M. Ward’s Metamorphosis Alpha, among other systems, and local group Saturday Night Space Opera has been providing a space for these games in the Twin Cities since 2015. Their upcoming “mini convention,” Tabletop Tesseract, could be seen as a culmination of those efforts. 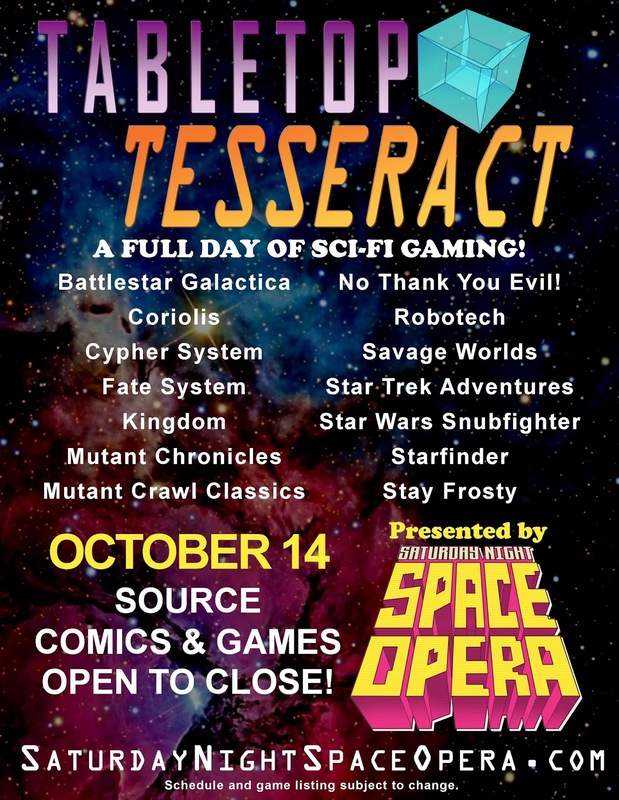 Tabletop Tesseract will take over the Source from 10:00 a.m. to 10:00 p.m. on October 14, 2017. A total of 19 games will be running throughout the day on six or so tables, including one of the old-school “sand tables” typically used for war gaming; a variety of gaming systems will be represented, but each and every one of the games has a science-fiction focus. Game masters at the event will provide rule instruction, pregenerated characters, and dice as needed, so the only thing interested gamers absolutely need to bring is an enthusiasm for role-playing and sci fi. Saturday Night Space Opera, like any community, took time to build. The gas cloud out of which it was born consisted not just of interest in a particular type of gaming but also the frustration of organizer Jay Exonauts, who had trouble finding the sort of gaming group that he wanted. Persistence and enthusiasm helped spin that gas into a star. “I’d been trying to find a regular game outlet on my own for a few years,” Jay explained. “I’d had several RPG- and geek-related blogs and made some online pals here in the Twin Cities. One of those people was John Till, and we’d met a few times in person, gamed at Con of the North together, but hadn’t collaborated on anything. Most of my gaming had been at the Source on Free RPG Day and a few other release days. But it was never regular, and GMs were sometimes not into what they were running. Jay and John worked together to reserve a table at the Source on the first Saturday of every month, and then planned their first game for January 2015. Attendance was slow at first—only a few people came to that first frigid meetup, and no one showed up in February—but they persisted. For March, they tried a different game, West End Games’ Star Wars, the role-playing classic that helped flesh out the Star Wars universe in the early days of the Expanded Universe, which holds a special place in the heart of many geeks of a certain age. It was a hit. From that point forward, they were able to continue moving on, turning attendees (and even occasional spectators) into regulars and GMs who brought new games like Numenera to the table. Saturday Night Space Opera continued to grow, which Jay attributes to authenticity, persistence. and organization. The group recently moved its meetups from the first to the second Saturday of the month, coinciding with the Source’s Family Board Game Night, to take advantage of the store being open past its usual closing time of 9:00 p.m.
Tabletop Tesseract will feature games for people of all ages, including a Minecraft-focused game for kids under the age of 12. According to Jay, making the event and the group in general accessible to younger gamers is a deliberate move, as many of the organizers and GMs involved are parents seeking to raise the next generation of gamers. This includes games of No Thank You, Evil! and plans for half a dozen kid’s events at next year’s Con of the North. Three, let your own personality and passion guide you: “Be yourself. That sounds super after-school-special-ish, but seriously, you’re doing this because you love it. You have a passion for it. The more that shines through, the more you’ll attract like-minded folks, and the more excited they’ll get about this little endeavor you’ve cooked up. Plus, you’ll have more fun writing up flyers when you speak from your heart. And you’re going to write a lot of flyers. I know this thing about passion is true, by the way, because I see it replicated over and over in other geek communities.” Jay cited the example of Julian Bernick, Ennie Award–winning host of Spellburn and writer for Goodman Games, and his efforts with Dungeon Crawl Classics and Mutant Crawl Classics. Tabletop Tesseract is the culmination of one geeky dream and the community that arose out of that—a community that is able to specifically focus on sci-fi gaming and allow people to try odd games they would have otherwise never heard of. What sort of geeky communities do you see a need for? Hopefully, following Jay’s advice, you can find a way to meet that need here in the Twin Cities. Learn more about Saturday Night Space Opera on the group’s website, or click here for more information about Tabletop Tesseract. You can also follow Jay on Twitter at @Exonauts and check out the Saturday Night Space Opera store on Zazzle for geeky swag with designs by local artist Bill Hauser.